Login as Customer by Mageplaza is the helpful extension which provides store administrators the access capabilities the same as customers. This will support stores on behalf of customers to take charge of their accounts in specific necessary or urgent cases. Why should social sharing buttons be added on sites? Admins have the ability to access customer accounts to support customers when they are processing purchase and checkout easily. With the customers who are not familiar with online shopping, the help from admin is really necessary. It is inevitable that there can be difficult cases which requires a store’ support team to involve. This situation needs the access to customer accounts to edit or make any updates. Therefore, login as customer function is really supportive to both customers and store admins. Quick and helpful involvement to support customers will help the store’s customer service to become professional. As a results, customers will feel satisfied and gain better shopping experience. 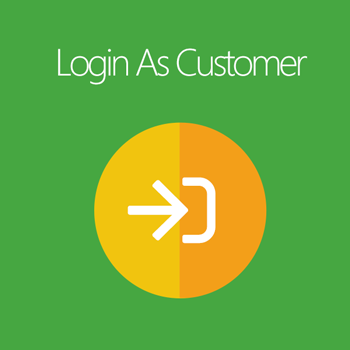 The main feature of Log as Customer module is that admins can log in a customer’s account to make some actions needed. Convenient places for easy access From the admin backend, admins can quickly access the account of any customer via Order View and Customer View sections. Here are two important places which all information of customers and orders is updated continuously. Therefore, Log as Customer link is placed here will help admins access conveniently and quickly without any difficulty. Just one click to access all On the mentioned pages, with just one click on “Login as Customer” button, admins are instantly redirected to customers’ account with full information as a real customer: my dashboard, my order, account information and many more. It is not only easy to access but also easy to edit or make any updates. Record every login action Any access to any customer account is recorded exactly in Login as Customer Logs section from backend. This is the report which records all access information including date and time, admin account, customer account. Manage and track easily In case a store has many admin accounts, the access report is very essential for the store owner to manage and track every single login as customer attempt. Besides, it is not allowed to delete or edit any data on this report. Therefore, it is definite that the store owner is always updated with any changes related to customers and avoid ill-intentioned access. Export function is also supported in this extension. From the report log, the store owner can easily export login data to save on the daily or monthly basis with ease. Hence, it is easy to save the login records and use for management or any specific purposes. The exported file formats which are commonly in use are CSV and Excel XML. filter_drama I am an admin. How can I access a customer’s account? You can easily login customer’s account to see information from Order View and Customer View in the admin backend. filter_drama Can I export the logs data to save daily? Yes, it can easily be done. From the report logs, click on Export button and select CSV or XML exported file. filter_drama I am a store owner. How can I manage the login history when my store site has many admin accounts? The extension supports the store owner to view access history. From the backend, please select Report > Customer > Login as Customer Logs. This extension works perfectly. We have the ability to access customer accounts to support customers when they are processing purchase and checkout easily. And our customers are happier now. Recommended! Thank you so much Mageplaza!